Studio Eleven 11: Etsy Item Views vs. Google Analytics Pageviews: Which to monitor? Etsy Item Views vs. Google Analytics Pageviews: Which to monitor? Traffic. Besides sales, it's the thing we crave as shop owners. We live to track it, measure it, and chop it up into little tiny pieces to scrutinize it. Item views on the Etsy item page. A recent post in the Etsy forum has brought to light a common issue when using what is called "server-side" tracking: it will incorrectly count "bot" (search engine & other crawler) visits as well as visits from you. See this thread for a full explanation from Etsy. This is bad, since it will inflate your item pageviews, making it look like it's getting more traffic than it is. And even with a fix in sight, there is a better tracking solution! The solution is (drumroll please! ): Google Analytics. (I bet you knew I was going to say that.) Why? It's browser-based, which simply means that it can filter out visits from automated programs. In fact, it does this automatically. You can also filter out visits from yourself, either at work, from home, or anywhere else you access your shop. Need to setup Google Analytics? Check out this Etsy how-to. Need to exclude visits from you? See this Google tutorial. So, we know that Google's data is more sound than the data available on the Etsy page. Here's a quick run-down on how to access pageviews through Google Analytics and some other quick tips that will make you never look at Etsy-provided pageview data again! Click "Content". Then "Top Content" or "Content by Title" ("Top Content" lists your items by page URL. "Content by Title" lists you items by your Etsy title). You should now see "Pageviews" and "Unique Pageviews". 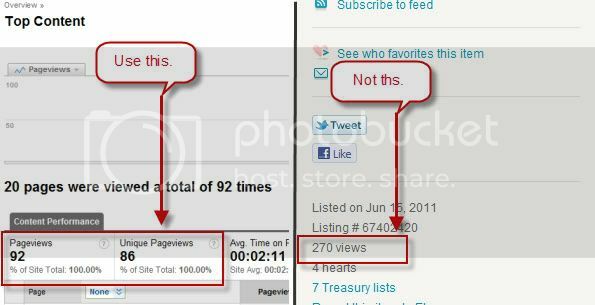 "Pageviews" means all views of you item, even in the same visit multiple times. "Unique Pageviews" means pageviews excluding items viewed multiple times in the same visit. The more accurate of the two is obviously Unique Pageviews. Click the blue URL or name of the page to load the next page. Here you will see only data for the specific Etsy item you clicked on. If you then click "Entrance Sources" under "Landing Page Optimization", you will see the traffic sources that brought people to this item. Pretty cool huh! Use this data to more accurately understand your most popular items and how people are getting to them. You can then optimize your item descriptions and targeting to sell better to your visitors, as well as add new marketing sources to your arsenal. One last tip: click the arrow with the box to the left of any blue link within Analytics to open that page in a new tab. This is great for investigating traffic sources without have to type in the URL or leave Analytics. Thanks for sharing this very useful information!